NASA’s live stream is up and running. NASA’s newest rover, InSight, is set to land on the surface of Mars around 11:00 AM PST on Monday. 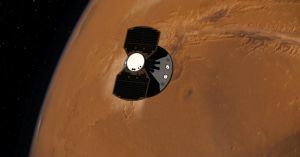 And in spite of NASA’s spotty track record with Mars landings, experts expect for InSight to touch down and get to work on several years’ worth of scheduled scientific research. We at Futurism will be watching NASA’s live stream of the event, and you can do the same below. The actual landing will happen shortly after this article goes live, but it will still take three hours after the landing for NASA scientists to confirm that the rover is fully operational. Recently, we’ve mourned NASA’s Curiosity rover, which spent 14 years exploring the red planet before finally crapping out in October. Then there’s the Kepler Space Telescope, which ran out of fuel and was decommissioned last month. While we deeply miss these lost scientific instruments, InSight could usher in a new era of Mars exploration and research, probing beneath the planet’s surface and letting us learn more about our planetary neighbor than we ever could — if it survives the perilous landing. We’ll be watching with our fingers crossed, hoping that it goes well. More on InSight: We’ve Seen Less Than One Percent of Mars. NASA’s New Lander Is Going To Change That.